This is a project I started some time ago but put to one side as I did not have the equipment (or skills) to finish it. It is a non-specific model of a small horizontal steam engine of the sort found in workshops and factories in the late Victorian period. The model is still available either ready to assemble or as a set of castings from Stuart's in Bridport, Dorset. I have included a couple of photos that show how far I have managed to get to date. to give some idea of size the cylinder is 1" bore by 2" stroke, the flywheel is about 7" diameter and the base is some 13" long. I now have the equipment but am not sure if I have yet attained any skills above that which I had when production stopped. I am however determined to finish the model at least so that it will run. 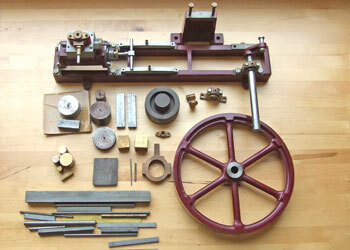 Photo (1) shows some of the kit, mainly pieces of steel and brass cut to length ready to machine. Most of the parts are fairly conservative size-wise and don′t give you a lot to hold onto. The castings are good quality and machine easily. 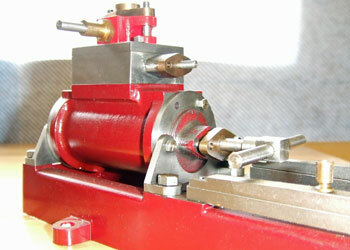 Photo (2) is a close up of the cylinder bolted down to the bed casting. The colour is a little bright it is more like the maroon of the flywheel. All I have to do now is convert the little bits of metal into parts that fit!